William Laman Furniture.Garden.Antiques - Rush Log Basket; Med. Garden → Garden Decor → Rush Log Basket; Med. Item No. 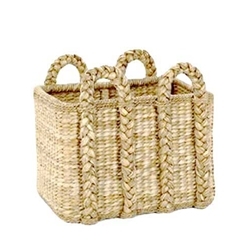 434 Medium woven Rectangle Rush Log Basket with four handles, reinforced frame. Perfect size kindling or log basket.